Jakemy 99 in 1 Repair Tool package will go with you to repair whatever you need. Buy it now! 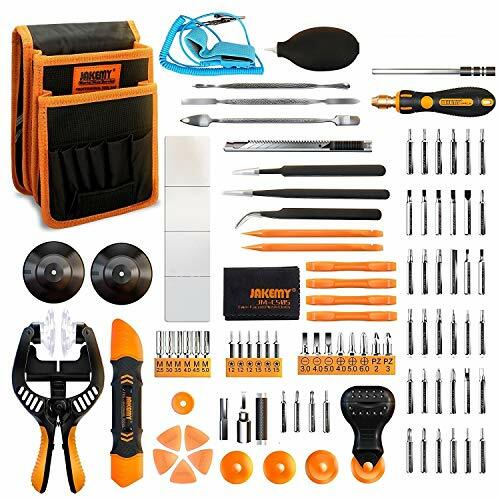 99 in 1 Full Set - included 50 chrome-vanadium steel magnetic bits, handle, opening plier, LCD suction cup, precision tweezer, anti-static wrist strap, utility knife, all kinds of plastic & metal phone disassembly tool set, roller screwdriver tool and etc. Reliable Material - Made of high-quality chrome vanadium steel, which is sturdy and durable, guarantee for long time use. Solve all the problems with one handle and wide variety of bits. NO RISK PURCHASE WITH GUARANTEED: Never pay for a product that you don't absolutely love. Buy with complete confidence as your purchase is backed by Jakemy 365-Day Money Back Guarantee (you don't have to resend the old one to us. ) Reply within 24 hours. Convenient - All things are stored in a small canvas bag, you can carry it on your waist, releasing you hands. Practical Roller Opener Multifunctional Tool - Two different roller openers can be changeable. One roller is suitable for disassembling laptop screen and the other is suitable for iphone 8. Suitable for Smartphone, Computer, Macbook, iPad, iPhone, Tablet, Laptop, Watches, Glasses, Camera , PS4/Xbox, Game Machine, and different kinds of Electronic Devices. Also suitable for Daily maintenance: Chairs, Desk, or Home Appliances. If you have any questions about this product by Jakemy, contact us by completing and submitting the form below. If you are looking for a specif part number, please include it with your message.